Took mom-in-law out for a spot of tea on Mother's Day. She loves the British three-tier kind, with dainty sandwiches and scones. There seem to be more and more places offering such treats. Someone recommended the tea at Conrad's Lobby Lounge in my list of high teas and I had seen a good review or two somewhere. 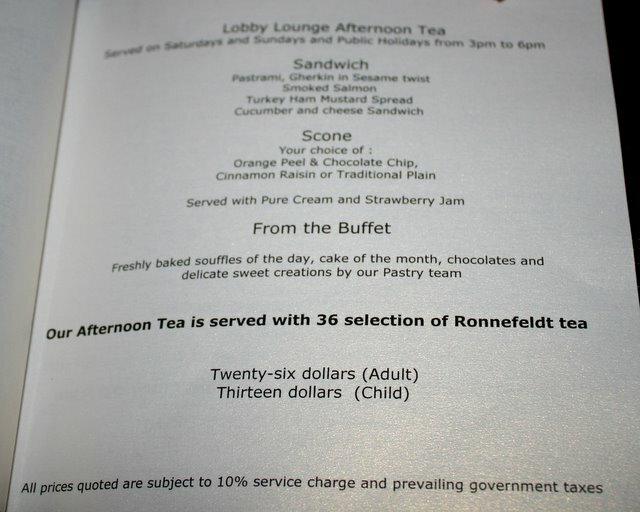 The sandwiches, as you can see, are really not much to shout about (the scones even worse), but they have really nice teas (36 flavours from Ronnefeldt), the same ones used by Rose Veranda at the Shangri-La. But unlike at the Shang, you only get one flavour here. I chose the Bourbon vanilla again. So yummy with cream and sugar. Notice the odd teapot that looks like its sitting on its side? Yeah, it's got a compartment for tea leaves near the lid opening. That steeps the tea leaves in the hot water when the teapot is on its side, but "traps" them upstairs when you pour the tea. However, the lid will inevitably drop off if you don't hold it while pouring. And you still need the separate strainer as some rogue tea leaves will still find their way out. Incredibly ineffective design, not to mention ugly. On weekdays (3-6pm), they have a choice of Asian or Western sets (S$22++ each). 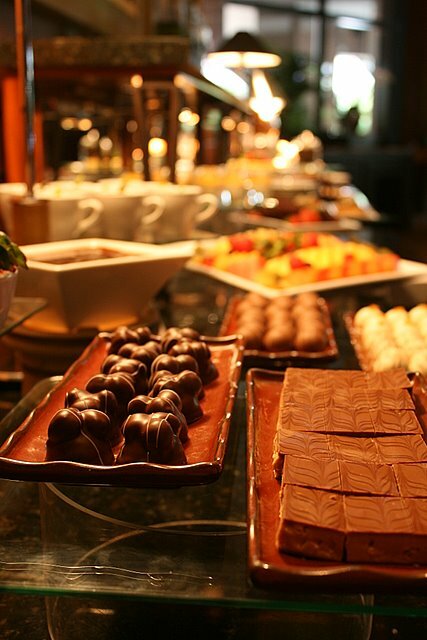 For weekends and public holidays, the menu (S$26++) includes a mini side buffet of cakes, pastries, chocolates and pies. They even have a broiler at the side for freshly made souffles. But most of the food was either too sweet or very rich and heavy. We just took a couple of bites and felt full almost immediately. Well, despite being in the lobby, the place still offers some privacy as it's cordoned off at one side. Ambience is pleasant enough and relaxing. There's live piano music in the background. Service, however, is pretty disappointing. We had to request for additional hot water for the tea. The sandwiches and items on the tiers are replenishable but the service staff won't do so until the platters have been completely empty for some time. And they took forever processing the check (I had a voucher which may have thrown them off). It was a nice time with the family, but I don't think I'd be back here again. Kenny, haa...you are kind to say that. I'm just lucky she's not the fussy dragon-lady type! 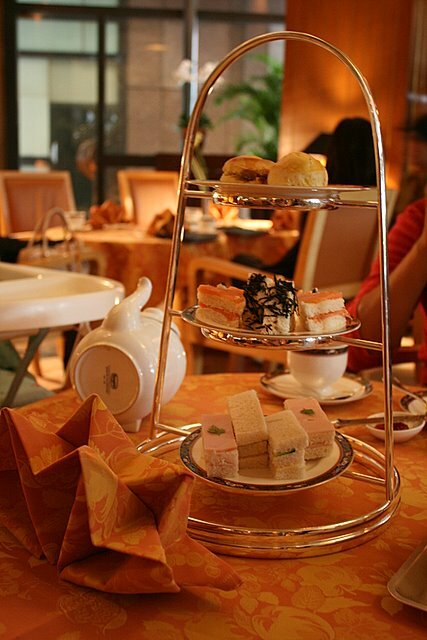 Looks like a nice outing; I love the look of those British 3-tier trays with their pretty desserts and such. This was a very nice thing to do for your mom-in-law! gosh, you are posting way too fast. i at most can make 2 or 3 post a week. hahaha! Hi Thanks for your wonderful reviews with lots of nice pictures taken, went to kazu and sushi kikuzawa though yout reviews. Although a bit pricey but my friends were all more then satisfied with the food. Thanks for the good work. Keep it up! Jackie, thanks! yes, they are very pretty! 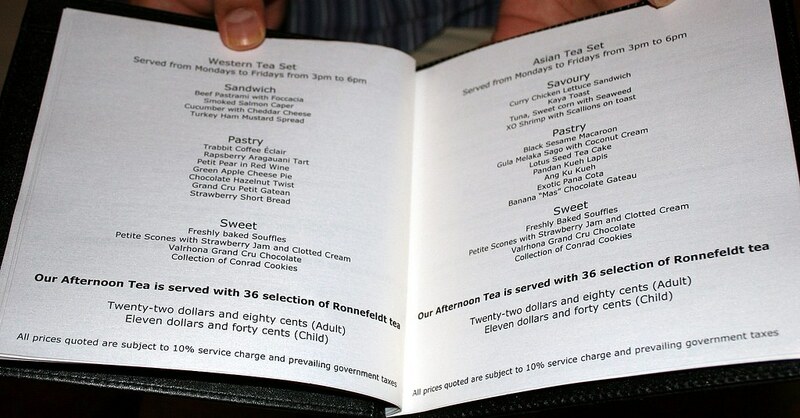 For cheap high teas...well, you can check the prices in my list. I still like Rose Veranda but it's not cheap. Ah sigh. Samuel, glad you enjoyed those places! And thanks for your encouragement! Hi there! I love the England-style hightea as well, esp the sandwiches & the scones. I had high tea 2day - similar to the 1s you blogged abt. do drop by for a visit when u get the time to!